Guile's fighting style is based on the idea of attrition. If you fight Guile for long enough, even if he does nothing at all, he'll get way ahead of you in terms of Gauge and tempo. 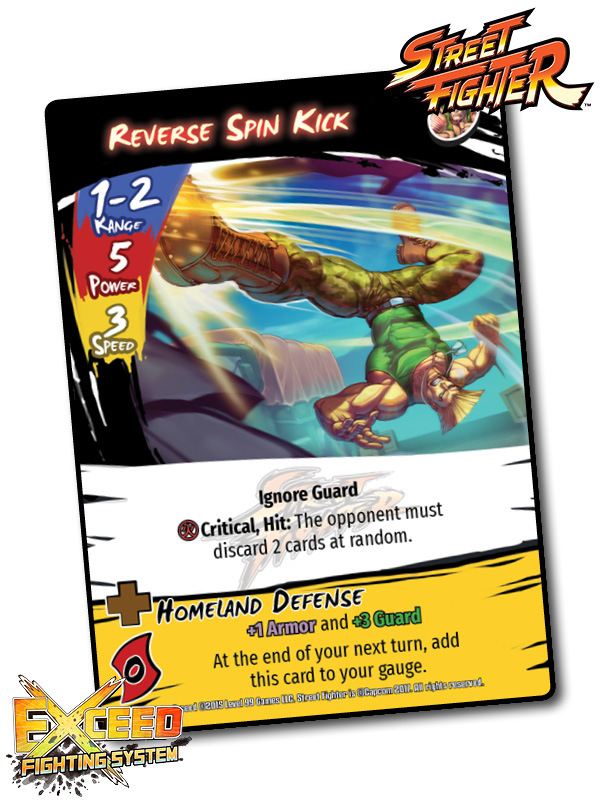 To drive this home, many of his Special Attack boosts have a similar theme–if Guile chooses not to attack on the following turn (either moving or building up his position instead), the boost will go automatically to his Gauge. This encourages opponents to fight more aggressively than they normally would, in order to deny this growing advantage. As a defensive fighter, Guile expects to go second and doesn't get much benefit from initiating strikes. He does possess a few mixups to surprise opponents who try to out-power him by using slower attacks, such as the Spinning Back Knuckle, which is capable of breaking Sweeps and Focus Attacks with sheer power. Most of Guile's moves give him some movement after the attack, so that he can withdraw to recover resources OR step in to continue putting on pressure. Since Guile is usually not initiating attacks, he's often going to get the next turn, and these small 'tempo moves' give him the ability to set up a deadly follow-up attack. Guile's projectile is slow and not spammable, like some others, but it does provide near-unbeatable confirm with its huge range and Guard. In order to make the trade positive, Guile can Critical the attack. After this attack, Guile gets a generous movement opportunity, so he can move straight into a follow-up attack. Guile's Ultra Attacks act as the payoff moves in his kit. Once he builds the Gauge he needs to unleash these deadly attacks, there isn't much opponents can do but try to dodge. Much like Vega, Guile also introduces a sustained Boost, his Shades of Glory, which will critical all his attacks and provide extra defense. I hope you've enjoyed this look at Guile! Look out for another fighter next week! Newer PostReview Review - A recap of reviews for our games!